First established back in 2004, UK hosting company Heart Internet have since won several awards for their shared, VPS, and dedicated hosting solutions, even being named PC Pro’s Best UK Web Host three years running from 2013 – 2015. With so much acclaim then, you’d probably imagine that Heart Internet have got it all; outstanding performance, exceptional value for money, and first class service. Yet sadly, my own personal experience with Heart Internet has shown that the company fall far short from their award winning reputation. Let’s cut right to the chase, at £8.99 per month, Heart Internet’s Home Pro plan is one of the more expensive shared hosting accounts on the market right now. I’m not going to do that today because, in all honesty, I just don’t feel that Home Pro -or any of Heart’s cloud-based hosting solutions- is actually a good value for money deal, especially when compared to other web hosts who offer more features and resources at lower prices. Though unlimited web space and bandwidth are a good start, I’ve found that Heart are pretty strict -and not always consistent- with their Fair Use Policy, restricting ‘unlimited bandwidth’ to somewhere between 5-8GB before my sites starting to see some serious performance issues. I’ll talk more about those later, for now, let’s look at Home Pro’s basic set-up. Despite having -theoretically at least- unlimited disk space, you can only use that for one single website, whereas most other unlimited plans don’t come with any restrictions (beyond fair use) on how many sites you can host. On the plus side, free site backup and restoration tools are included in the price, as is a very generous 10,000 mailboxes for managing your business email, each with web mail access, unlimited email forwarding and autoresponders. The only drawback here, is that the company wants you to pay an additional £19.99 per year for basic virus scanning, something which even the most basic of shared hosting providers normally offer free of charge. Ultimately, I don’t believe Heart Internet offer anything which justifies the high price tag. As you’ll see throughout the rest of this review, even when they’re at their very best, they’re only ever on a par with other, more affordable services. Most web hosting companies will offer at least a year’s free domain registration with their package, whilst others are stating to promote ‘free domain for life,’ deals, where you never have to pay for your domain for as long as you host your website with that company. Heart Internet however, are not most companies, and don’t actually offer anything in the way of a domain name freebie. Instead, you’ve got two options, both of which involve adding to the cost of launching your new website by paying separately for a domain name. Buy one directly from Heart, and you’ll be paying yearly fees of £6.99 for a .co.uk, £10.99 for a .net and a cool £11.99 for a .com. These prices are actually not the most expensive I’ve seen out there, yet their far from the cheapest either. You can get a much better deal elsewhere, such as with 1&1, a German company which, whilst not the best hosting company on the planet, do at least offer some incredibly low cost deals on domain names. This brings me to the other option; registering a domain name elsewhere and configuring it to work with your new Heart-hosted site. Here’s where I ran into the biggest problem whilst setting up a website. As a professional web developer and website manager for a number of years, I’ve lost count of the amount of external domains I’ve had to link up to a website hosted by a third party, and always liked to think I’ve got a pretty good grasp on how it’s done. That was until Heart Internet came along and made things far more complicated than they should be. Something that is usually a fairly simple process required several support tickets and a whole heap of time spent tearing my hair out to get right. Though I got it taken care of eventually, it was so annoying that I was almost tempted to scrap the idea and just start over with a new domain registered with Heart Internet themselves, something which I have a sneaky suspicion the company would much rather I did anyway. Heart may not have a lot going for them, but I will at least give them kudos points for making their shared hosting plans relatively simple to put together. Eschewing popular systems like cPanel and vDeck in favour of the lesser-known control panel eXtend (something the company has in common with other smaller hosts like Webfusion), though to be honest, you’d likely never know the difference if you didn’t spot the eXtend logo on your user interface. The interface works much like its better-known rivals in that all the options for managing your account and developing your website are represented by large visual icons, grouped into individual sections. For example, all your email tools are in one box, web stats and analytics are in another, one-click installation apps are in a third, and so on. Do the left, you’ll have a quick overview of your account, including how much space and bandwidth you’re using. It’s pretty easy to get used to, and should be familiar enough to experienced users without being daunting to first timers. The only problem I had with usability was the problem configuring an external domain to my new hosting package that I mentioned earlier when we talked about domains. It was frustrating to say the least, but once it was over, I ran into no other issues and found the service to be as user-friendly as any other out there. As I mentioned earlier, Heart’s promise of ‘unlimited’ bandwidth isn’t always what it seems. I’ve found that even a modest increase in traffic over a short period of time can dramatically reduce my site’s loading speeds, and I’ve seen many instances of sites being pulled for what the company deems excessive bandwidth hogging. My own experience has shown that uptime in generally decent, but merely having a site online is no use if that site performs so sluggishly as to turn away visitors. If you’re looking for a simple drag-and-drop style website builder with Heart, you’ll have to look outside of their hosting plans at their separate SiteDesigner packages. These offer a similar solution to the likes of 123-Reg’s Instant Site tool, in that you get a basic web editor, a small number of pre-designed templates (15 to be exact), and 2GB of disk space to host just five pages for a total of £5.99 per month. Upgrading to the ‘SiteDesigner Unlimited’ plan removes the restrictions on storage and number of pages, and increases the number of pre-designed templates to 50. The latter of these two also proves to be the better option for eCommerce as it comes complete with PayPal integration, though to be honest, you can find a better deal on drag-and-drop website builders with hosting features elsewhere. My pick is iPage’s Essential hosting plan, which is not only more affordable than Heart Internet, but also comes with an inbuilt web builder from Weebly, a platform regarded as one of the web’s best thanks to its user-friendliness and overall quality of its designs. Fortunately, Heart do fare better when it comes to supporting major Content Management Systems and applications. 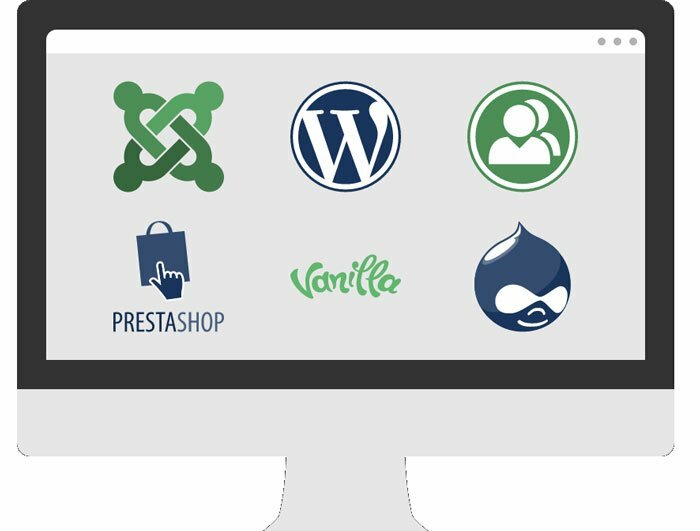 The company boast ‘One-Click WordPress Installation’ as a key selling point of their Business shared hosting plan, but the other two major CMS platforms, Drupal and Joomla, are both accounted for here too. Together, the ‘Big Three’ make up just a small number of the 70 applications available. Also included, you’ll find the likes of Concrete5, Moodle, and the Typo3 blogging platform, along with forum software, survey tools, and photo gallery add ons. Though this bundle of applications is no doubt one of Heart’s better elements, it’s worth mentioning that it’s nothing you won’t find elsewhere for less money. The same can be said about the company’s features for more advanced users. PHP, Perl, Python and Ruby are all supported, and you’ll also have SSH access, cron jobs and IP blocking functionality. Again, this is all good stuff, but it isn’t anything to get excited about. All of these things are pretty standard web hosting features, and don’t exactly do much to make Heart Internet unique. Heart’s package of eCommerce tools is essentially the same as you’ll find with most of their competitors. The suite of apps I mentioned earlier provides one-click installation and set-up wizards for top shopping cart platforms including OpenCart, osCommerce, CubeCart, PrestaShop, Zen Cart and AgoraCart, along with open source invoicing application, Simple Invoices. That said, I always think the best web hosting sites for eCommerce are those that include at least some form of SSL (Secure Sockets Layer) certificate, which provides a level of encryption between your website and a customer’s web browser to ensure that all data processed during the transaction is kept private and secure. Heart Internet do provide SSL certificates, albeit at a premium price. A simple SSL plan with secure browsing, 128-256-bit encryption and a browser padlock will set you back £49.99 per year, whilst for an extra £100 you also get the peace of mind that comes from having a $10,000 user warranty on hand. Naturally, the added cost of SSL certificates only makes the already high price of hosting a website with Heart Internet all the more expensive. If you are looking to start an online store, I’d actually recommend HostGator’s Business Plan, which includes both a free private SSL and dedicated IP address (another essential security feature for eCommerce sites). Regular hosting charges are comparable with Heart Internet’s own Business package, and at time of writing the company were currently promoting a special offer of $5.95 (£4.10) per month for this particular plan. Prompt, efficient, and helpful customer support is the hallmark of any good web hosting company, and to that end, Heart Internet do deliver. At least, they do to an extent. The company’s ticket-based support system is better than many I’ve used in the past, with average response times clocking in at around an hour and the majority of issues resolved first time round. Only on two occasions did I require more than one back-and-forth with Heart’s tech support, and that was for a more complicated matter relating to domain names which I’ve covered above. Even then, problems were ironed out without a great deal of fuss, and I’m happy to report that the company did do a good job via ticket support. One other strong aspect of Heart’s customer service offer is their vast Support Database, which at time of writing boasted over 1700 articles (trust me, for the sake of this review, I counted), covering just about every possible topic relating to web hosting and domain management. The articles themselves are clearly written and easy to follow, which is useful since Heart’s customer service page states prominently that they want you to use this before you file a ticket. And that’s where the negatives start to creep in. The Support Database (similar to other hosting provider’s Knowledge Base) is certainly useful, though you get the feeling that it’s there as much as a barrier to stop you contacting customer support as it is to actually help you. Indeed, the main support page in itself is very unfriendly in its tone, whilst the lack of phone, email, or even live chat support options only furthers my suspicions that Heart would rather not talk to their customers at all unless it’s to sell something. If you’re at an intermediate or advanced level when it comes to managing web hosting and websites themselves, you’ll more than likely be just fine with the support database and ticket system. However, from my own personal experience working with those who are just starting out on their hosting journey, I understand that it’s often a lot easier to have an expert on hand to talk you through things, making customer service just one more reason why I’m rather disinclined to recommend Heart Internet to newcomers. Regular UK Web Hosting readers will hopefully recognise that I always try to weigh up the pros and cons of every hosting plan I review in order to present the most fair and accurate report possible. Unfortunately, the more time I spent with Heart Internet’s Home Pro shared hosting package, the harder I had to work to pluck out any positives. Sure, they are there; the large Support Database, one-click installation of 70 different Content Management Systems and other web building tools, and the general user-friendliness all work in the company’s favour. Yet, as I’ve already mentioned several times by now, these are -or at least should be- all standard features of any good web hosting package. You’ll find pretty much the same thing for a fraction of the price elsewhere. Meanwhile, the bandwidth issues, lack of telephone support, and domain name hassle all leave me struggling to recommend this particular company to anyone.